Fresh indications have emerged which go to suggest that the latest economic reforms, under the “neo-liberal” guise, have not in any way worked in favour of the disadvantaged sections of the rural population in Gujarat. The latest National Sample Survey (NSS) data, put out by the Government of India, show that only 1.2 per cent Gujarat’s scheduled tribe (ST) households and 2.7 per cent of the state’s scheduled caste (SC) households owned more than four hectares (ha) of land. This is in sharp contrast to a huge 17 per cent of higher castes owning more than four ha of land. The figures find their place in “Employment and Unemployment Situation among Social Groups in India”, published in September 2012. Worse, great majority of ST households, 92.1 per cent, are marginal farmers; they own either no land or less than one ha of land. Things are not very different for SC households – 89.4 per cent of the SC households own either no land or less than one ha of land. As one climbs up the social ladder, things start looking better – among the other backward class (OBC) households, those owning no land or less than one ha are 81.6 per cent, and the relative percentage further falls to 52.2 per cent for the upper caste households, characterized as “others” by the NSS report. In fact, NSS figure, which are based on primary survey among all Indian states during 2009-10, suggest that land owning pattern in Gujarat lately appears to have tilted in favour of the upper castes more than any other state. Thus, 17 per cent of the upper caste households owning four ha or more is higher than most states, except Madhya Pradesh (22.7 per cent). 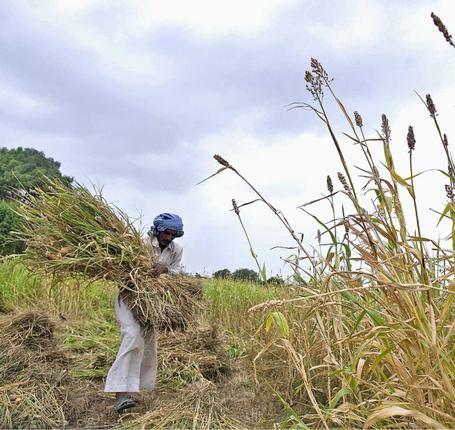 The all-India average of upper caste farmers owning more than four ha is just five per cent. Curiously, as against 52.2 per cent of upper caste households, owning less one ha of land in Gujarat, the all-India average is a whopping 75.1 per cent. Wage labour: The NSS survey suggests that poor or no land ownership with ST and SC rural households forces majority of the population of these two categories to wage labour. Thus, in Gujarat, 51.9 per cent of the state’s ST households and 66.4 per cent of SC households depend on wage labour, mainly in agriculture, for their survival. This is quite high compared to several other states, with the all-India average being 46.5 per cent for ST and 58.9 per cent for SC households. Here, again, the percentage of households depending on rural labour for their livelihood goes down as one climbs up the social ladder – it is 36.4 per cent among Gujarat’s OBC households and a mere 18.1 per cent among the upper caste (those falling in the “others” category) households. Purchasing power: The NSS figures throw further light on the ability of different caste groups to spend money in the rural areas. Recording it under the term monthly per capita expenditure (MPCE), which suggests the purchasing power of a person or a group of persons, the figures show a very interesting picture. As expected, the ST group has the lowest MPCE, Rs 879, but what is particularly disconcerting is that it is worse than majority of Indian states. The ST households’ MPCE is higher in Andhra Pradesh (Rs 999), Assam (Rs 1,032), Himachal Pradesh (Rs 1,370), Haryana (Rs 1,401), Karnataka (Rs 901), Kerala (Rs 1,208), Maharashtra (Rs 961), Punjab (Rs 1.510), Rajasthan (Rs 984), Tamil Nadu (Rs 989), Uttarakhand (Rs 1,016), and J&K (Rs 1,223). The tribals of only backward states such as Bihar, Chhattisgarh, Jharkhand and Uttar Pradesh are found to have better purchasing capacity compared to Gujarat. As for SCs, Gujarat fares better than many states, with an MPCE of Rs 1,088. However, here too Gujarat is not No 1. The states with a higher MPCE are – Andhra Pradesh Rs 1,155, Haryana Rs 1,165, J&K Rs 1,186, Kerala Rs 1,400, Himachal Pradesh Rs 1,350, Punjab Rs 1,271 and Uttarakhand Rs 1,064. Interesting though it may seem, OBCs’ MPCE is found to be worse than that of SCs, with Rs 1,038, which is lower than a large number of states, including Andhra Pradesh, Assam, Haryana, Himachal Pradesh, J&K, Maharashtra, Kerala, Punjab, Rajasthan, Tamil Nadu and Uttarakhand. Those forming the “others” category (mainly upper castes) are found to have an MPCE of Rs 1,590 in Gujarat, which is much higher than not only ST, SC and OBC categories. Interestingly, it is also higher than the national average of Rs 1,281, indeed a large number of states.